Check out your customer's purchase history and a preference on Karte. It will help you communicate better. as one of your staffs! Fashion stores, clinics, beauty and hair salons are using Karte. and staff comments on their PC/tablet and approach their blue-chip customers. 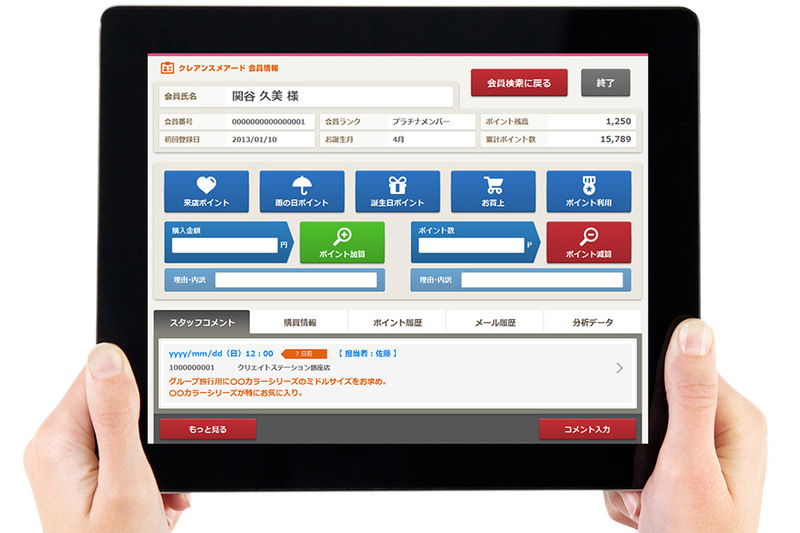 manager, but your staffs can do the CRM on tablet or PC! tool for adding/deducting points at the same time. "Points for visiting your store"
Use Karte as a point card terminal. Award points for purchasing, visiting, referring, birthday and so on. You can see the analytics and recommendations. know your bestselling products and frequently bought together products and many more. Service which moves your customer's heart. See members information Fist visit, last visit, and membership rank etc. Reward bonus points Bonus points for visit, rainy day visit, and birthday etc. Check out staff comments and customer's purchase history then you will know what to recommend. See other charismatic staffs' comments and learn from each other. Also, find out your customer satisfaction and claims from the text analytics. You can use Karte on any of your PC or tablet, and if you want you can connect a barcode scanner with it. Even if your business is in a department store, which has its loyalty program, you can still have your own and have full control over your data and insights. Providing SaaS/ASP enables you to implement the system very fast via the internet. No need to change your current POS, or buy new point card terminals. We are working for your customers satisfaction.